Big changes are underway at Walgrove Elementary School! You may have already noticed the removal of all the temporary bungalows on the south side of campus – the buildings that used to house Ocean Charter are GONE. Left behind is 25,000 square feet of asphalt that will soon make way for a new green space. Remaking 25,000 square feet of of the campus is the first step of a much larger project : the re-envisioning of the whole campus, to transform Walgrove into a sustainable and performative schoolyard habitat. This Weds, August 22nd at 6 pm we are inviting the whole school and the community beyond to come and learn about the progress we have made and the possibilities that we can create together. (Please see all details on flyer.) 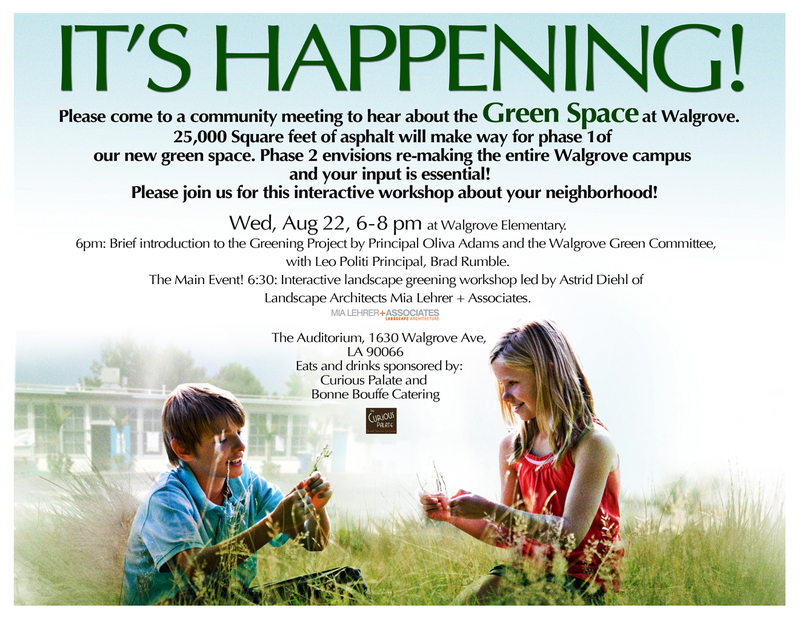 We want to consider how a greener and more sustainable campus can enrich our students’ experience at Walgrove Elementary School. It is important that we come together as a community to create a shared vision for the future of our school. This workshop, the goal is to get input and ideas for the entire schoolyard/campus to understand better what the community needs and would like to see. A small group of dedicated volunteers has worked diligently over the last several months with LAUSD to identify opportunities and limitations for a greener campus. A growing and impressive list of partners have come on board to guide, advise, design and build with us. What we need now is the full participation of our school community and everyone of our neighbors. PLEASE COME!!!!!!! Bring your neighbors!! Your input is extremely valuable and community participation is the key to achieving such a big undertaking. Childcare will be available! Refreshments will be served. Mark your calendars! Looking forward to seeing all of you there. It’s going to be an exciting year…. This entry was posted in Announcements, Public School and tagged community, envisioning, green space, greening, habitat, joint use, outdoor classrooms, partnerships, Walgrove by gomama. Bookmark the permalink.